The Bay of Plenty Civil Defence Emergency Management Group (BOP CDEMG) includes all seven councils in the region, governed by members elected from within this group. The Co-ordinating Executive Group is a mandated committee made up of the CEOs of the local authorities, along with representatives from Fire Services, Police, District Health, MOH and a Group Controller. In an emergency, BOP CDEMG initialises the Group Emergency Coordination Centre (GECC) under the direction of the Group Controller, to coordinate all activities for the whole of the Bay of Plenty. Simultaneously the Emergency Operations Centre (EOC) was set up at Whakatane District Council. GECC is located primarily at the Bay of Plenty Regional Council office in Tauranga, but is re-located to Whakatane or other as appropriate. When a stop bank breached its banks on the Rangitaiki River on April 6th, a state of emergency was declared and Edgecumbe evacuated as water flowed into the town. Eagle Technology staff were coincidentally in Tauranga for a scheduled BOP CDEMG meeting to discuss the application of GIS situational mapping in the event of an emergency. The meeting was cancelled and instead members of the Eagle Technology GIS technical solutions team assisted BoPRC’s GIS Manager, Glen Clarkin, to prepare a mapping portal to support situational awareness. This mapping portal included a live situational awareness viewer and field apps used internally for coordinating the response. These same maps were used to provide up to date information with the Public through public maps on social media and the Whakatane District Council website. 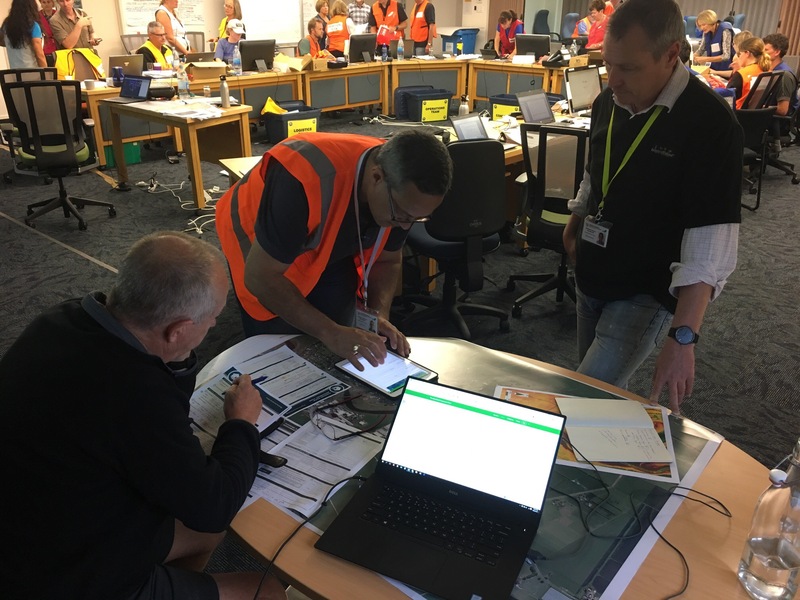 What followed was a collaboration between the GECC and the EOC in Whakatane involving GIS staff from WDC, BoPRC, Tauranga City Council, Western Bay of Plenty District Council, New Zealand Urban Search and Rescue and external GIS consultants. Web mapping applications were quickly configured for incident intelligence, welfare assessment, building assessments and transportation updates. The apps then informed the situation reports, briefings, paper maps, and other information products throughout the Cyclone Debbie and Cook Response. The most notable positive outcome, was a rapid building damage assessment using Survey123 for ArcGIS to complete the field data collection (over 500 assessments) in just 48 hours. Eagle Technology also provides managed IT services to Whakatane District Council and this team was deployed to assist with the set-up of the GECC at the Whakatane War Memorial Hall. During this setup networking and other IT configuration issues were resolved to allow the GECC team to commence operation. The Eagle Whakatane team, Tim Wood, Luke Batt and Daniel Thurmath were joined by Auckland based Simon Watt-Wyness, and supported remotely from Eagle’s Auckland Network Operations Centre, and Servicedesk, throughout the following days, to ensure no support issues were missed. In the ensuing recovery period, this team continued to provide IT support, as well as linking and configuring LAN and Wireless access for additional buildings required to accommodate WDC emergency teams and external support agencies. Over the next seven days more than 1600 people movements were logged through the EOC, with most accessing these guest networks. Work continues as Whakatane District Council supports the community with initiatives such as Public Wifi access into Edgecumbe Library and War Memorial Hall. Eagle has installed and configured these Wifi networks over Spark Digital and Evolution Networks links. The stated aim of the BOP CDEMG is to provide a coordinated and integrated approach to emergency events through Reduction, Readiness, Response and Recovery. The events of early April 2017 necessitated the action plan already in place. In any such situation, real-life application brings lessons that are invaluable as foundations for forward planning. Prepare incident maps and apps in advance of disaster with sharing agreements between agencies in place. Train key staff on the role of geospatial staff and information in Coordinated Incident Management System (CIMS). Use these same maps and apps throughout all 4 R’s (Reduction, Readiness, Response, and Recovery). Stephen O’Leary, GIS Team Leader at Whakatane District Council, concluded that the use of the mapping portal presents an opportunity to fundamentally alter the way future emergencies are managed. The cloud based model enabled the rapid build of varied data that displayed at the click of a button, and provided decision makers with a sophisticated model to better understand the situation. Eagle Technology continues to offer its assistance with the recovery and the welfare of those affected, and to share in the dissemination of information to other organisations to assist in preparedness for similar events.